To re-set your password, follow the ‘forgotten password’ instructions on the ‘sign in’ page. Please note, for security reasons we are unable to send your old password via email. Making a purchase is easy. Simply select your items, along with size and colour, click ‘buy now’ and follow the straightforward prompts on screen. If you have any problems, please contact our orders department either by email at customercare@marygrant.com or by telephone on +353 (0) 45 435252 10:00 – 18:00 Monday to Saturday (GMT). We are closed Sundays & Bank Holidays. If you have any questions which are not currently answered on our website, please contact us at Customer Care either by email at customercare@marygrant.com or by telephone on +353 (0) 45 435252 10:00 – 18:00 Monday to Saturday (GMT). We are closed Sundays & Bank Holidays. Yes, it is possible to place an order by phone. Simply call one of our personal stylists in either store. Newbridge : +353 (0) 45 435252 Monday – Saturday 10am – 6pm. Dublin : +353 (0) 1 6750881 Monday to Saturday 10am – 6pm & Sunday 12pm – 6pm. After providing us with the details of the item you wish to purchase and your billing information, we will process your order. Look for the search icon at the top of our home page. If you have the style number, enter here. Otherwise you can enter key search words which will direct you to the pages closest to your search. Once you have selected your desired category, you can further filter the listings using the drop-down options within the title bar of the page. Throughout the site there is also a ‘Search’ function, which can be used to look for certain products using key words. Most items shown are in stock. If a product does not appear in a specific size in the ‘Size’ drop-down, this means the item is out of stock. Please be aware that even if the product is in your shopping bag it isn’t reserved and will therefore be available to other customers while you are browsing. Items which have not yet arrived in stock, will have the expected delivery date under the product image. Items that are exclusive lines or limited stock will have ‘exclusive’ or ‘limited’ underneath the product image. Further details will be in the product description. If an item you are interested in is out of stock, please email or telephone your stylist to inform us of your interest and we will do our best to get the item for you. You can contact us by email at customercare@marygrant.com or call us at either store during opening times. You can also leave a voicemail outside of opening times, which we will return your call when we re-open. Newbridge : +353 (0) 45 435252 Monday – Saturday 10am – 6pm. Dublin : +353 (0) 1 6750881 Monday to Saturday 10am – 6pm & Sunday 12pm – 6pm. Do you do ‘made to order’? Most items in the collection are ‘ready to wear’. On some items, like our alternative Bridal Wear, we can order specific sizes. We cannot however offer a bespoke service. Please contact your stylist with any query & we will get back to you as soon as possible. We do not offer an alterations service at this time. We are happy to take deposits on any item. This can be done in person at either store, by contacting customer care : customercare@marygrant.com or by calling us during opening times. There a 2 ways in which you can purchase a gift vouchers, for any amount of your choosing. By phone : Please allow 3 working days for hard copy gift vouchers to be sent by post. If you are purchasing for a gift, we can send a gift voucher email to the recipient of your choice. Can I redeem a credit note on line? If you have a credit note, you will need to place your order over the phone. What payment methods does marygrant.com accept? Is it safe to use my credit card online at marygrant.com? We use Realex for all of our online transactions. Your card details are never visible to any persons operating this site. They are also not stored on our site. “Inherent to our operations and business approach is the need to provide a secure, robust and reliable payment processing service. Information security is our top priority and one of our company values. To this end we have invested in extensive security controls and infrastructure and we’re constantly updating and improving our online payment systems to ensure that your money always gets where it needs to go, safely and securely. Realex Payments are certified and approved by several leading financial institutions. Our systems and security controls are based on current industry standards and our staff continually research changes in the industry to ensure our controls are updated when required. There are several layers of technology in place to ensure the confidentiality, authentication and integrity of information. After you place your order, you will receive an email from us acknowledging that your order has been received. This does not mean that we have accepted your order. If your item(s) has been sold out in our warehouse, we will try our utmost best to locate the item(s). Only after your credit card details have been approved, the delivery address has been verified and the item(s) located, will your order be accepted and the item(s) shipped. We will keep you informed of any issues arising, by adding notes to your order, which you will receive by email. Yes. When we dispatch your order for delivery you will receive a unique tracking number by email. Once in receipt of this tracking number you can check the current status of your shipment. Alternatively, you can email us @ customercare@marygrant.com and we will track the order on your behalf. 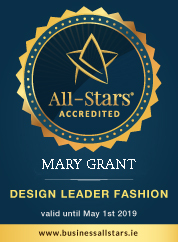 At Mary Grant we believe that the service you receive through purchasing online should be as special as shopping in one of our stores, therefore the packaging you receive your goods reflects this. We are also aware that our customers like to be discreet in their shopping. Therefore, your purchase will arrive beautifully wrapped in tissue paper but the outer box which will be unbranded white cardboard. Does marygrant.com have seasonal sales? Yes, we do have seasonal sales, at the end of each season. Occasionally, we may have special offers during the season, which will appear in our sale department on the website. If you would like to be notified of these, please sign up to our mailing list. Please note marygrant.com cannot guarantee that its prices will be equal to offline stores when they go on sale. We ship to the following destinations : Ireland | UK | All EU countries | North America | Canada | Australia | UAE. For all other destinations, please contact us directly and we will try to ship to your location. To make sure that your gifts arrive on time, please check our delivery times. If so, the shipping company will contact you by telephone once your Items are in customs to let you know the cost. This may delay your delivery time as goods held at customs will be your responsibility to pay the necessary charges for local authorities to release the goods. Yes we can deliver to your hotel. Can I change or amend my order after it has been place? We can also add pieces to an order up until the time it has been despatched. Just contact us as soon as possible if you want to make any changes to your order. If you need to make any amendments, please call customer care for assistance: customercare@marygrant.com or call us during opening times at either store. Sunday 12pm – 6pm. ( closed bank holidays). You can also contact us directly by clicking on the red chat box at the bottom right hand corner of your screen. Can I change my shipping address after my order has been despatched? All your purchases are insured against theft and accidental damage whilst in transit from marygrant.com to your shipping address. Once your package has been delivered and signed for at your specified address, it is no longer covered. As marygrant.com purchases may be delivered to addresses other than the billing address given by the card holder, for example as with the case of a gift being purchased and addressed to a friend, as a security precaution, an e-mail and a copy of the invoice will be sent to the card holders registered e-mail address and home address, and we will require a signature upon delivery for all goods shipped. We value every customer & every purchase & we always aim to please. We know our customers respect and understand that we reserve the right to run our business in a business like way. We understand that customers may occasionally be disappointed if they purchase an item at full price that is subsequently offered at a reduced price. In recognition of this fact & as a gesture of good will, we have the following Price Adjustment Policy. When you purchase an item which is subsequently offered at a reduced price within 7 days of the original purchase, we will refund you the difference. Adjustments are only offered if the original purchase was on a full price item. Adjustments are only offered on the first reduced price. Goods originally purchased at reduced prices are excluded. Price adjustments are not offered on clearance items. Price adjustments are not offered on End of season sale items. Items purchased with promotional discounts or coupons are excluded. Price adjustments are offered on online purchases, but not on shipping charges. To receive your price adjustment, you must arrive instore within 7 days of the original purchase with the original receipt in hand. Polite requests will be honoured, but all adjustments are at the sole discretion of the manager. If the store manager is not present, a member of staff will take your details & the request for adjustment will be processed by the manager when next on duty. To receive your price adjustment for online purchases, please email customercare@marygrant.com with your original order number + details of the item to be adjusted. Every garment has a care label sewn to the inside. These care labels will give you the full fibre content & recommended care for that garment. We recommend that you do not deviate from the care instructions given as to do so could damage your garment. We also put as much extra information as possible in the product description on the website. This information will where possible explain the reasons why the garment must be cared for in a particular way. Caring for your cashmere knitwear and precious fibres…please read our pilling document. We always recommend how you should wash, dry and store your garments. We recommend certain types of hangers for specific reasons, whether that be holding shape, not stretching etc etc. In the garment care department of our ‘shop’ online, you will find some products which we recommend. If you have any further questions which we have not covered on the website, please do contact us at customer care: customercare@marygrant.com or by telephone on +353 (0) 45 405006 during our office hours of 09:00 – 17:00 Monday to Friday & 10:00 – 13:00 Saturdays. We are closed Sundays & Bank Holidays.